Would you like to show your high school students the thrill and excitement of performing at an NCAA sporting event? 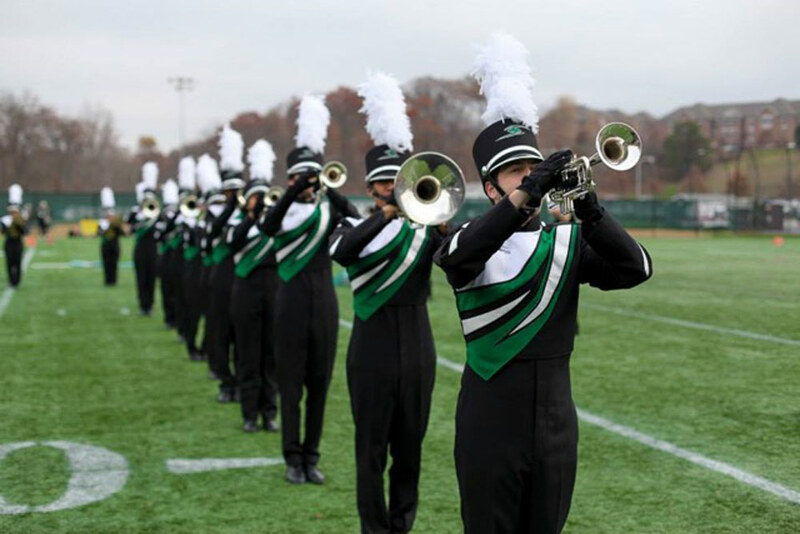 If so, the Stevenson University Band Day Experience is the perfect opportunity for you and your group! The SU Band Day Experience kicks off with a brief morning rehearsal where your students will get the opportunity to play alongside SU band members, and learn tips from our marching band faculty and staff. Following the rehearsal, we are providing a fun luncheon for all the students and directors. Your students will be able to socialize with the members of the SU band, and students from other local high schools. There’s no better way to get all of your college and marching band questions answered. Plus, we will have great prizes to make the day even more exciting! After lunch, the massed SU and high school bands will then perform in front of thousands of appreciative fans during halftime of the Stevenson University football game! To make sure that high school students can honor other school and familial commitments that day, they may leave after the massed band half time performance, but are encouraged to stay for the entire game day experience. Watch the Band Day Experience Video Trailer! Due to the popularity of this event space is limited. To register for the 2019 Stevenson University Band Day Experience, please complete the form below. Once submitted, we will be contacting you soon regarding schedule and logistics. Thank you. What day and time can you have a Stevenson University Music Clinician meet to discuss the event and hear the band play the music?